Officer Dan Mead, center, holds a letter of thanks from second grade students at Yeshiva Schools of Pittsburgh. He is flanked by Rabbi Yisroel Rosenfeld, left, and Rabbi Henoch Rosenfeld, right. Officer Dan Mead woke up on Saturday, October 27, and put on his uniform, as he does every morning. He checked in at the station-house and began his shift patrolling the streets of Pittsburgh with his partner, as he does every morning. Hours later, their routine descended into chaos. “Active shooter,” crackled his radio. They were the first officers on the scene. Unhesitating, Mead and his partner approached the building, guns drawn. As they neared the entrance, he came face to face with the gunman, whose rifle was pointed directly at them through a window. The attacker fired round after round, striking Mead in the arm. 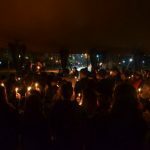 The officers’ actions are believed to have saved countless lives, as it is speculated that the attacker was on the way to his car, which was laden with additional ammunition, to continue his deadly attacks, possibly at additional sites. After the officers approached, the gunman instead turned back to hide inside the building, where he was arrested by a SWAT team. 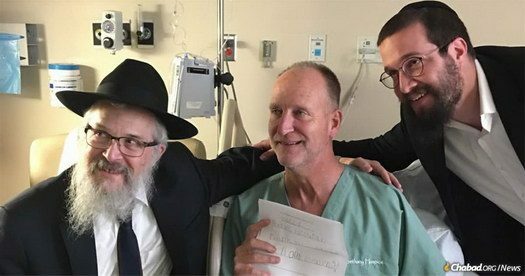 As Mead was recovering in UPMC Presbyterian Hospital, he was visited by Rabbi Yisroel Rosenfeld, rabbi and director of Chabad Lubavitch of Pittsburgh, who was accompanied by his son, Rabbi Henoch Rosenfeld. 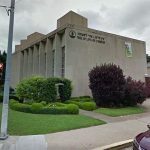 Mead was introduced to the rabbis by Dr. Mylynda Massart, a prominent Pittsburgh physician who is a family friend of both the Rosenfelds and the Meads. 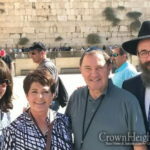 Massart first met Chabad in Salt Lake City, Utah, where she was a member of Rabbi Benny Zippel’s Chabad congregation before moving to Pittsburgh and joining the local Jewish community. 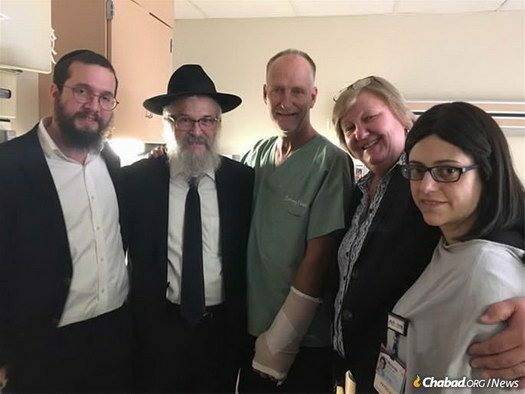 Rabbi Henoch Rosenfeld, Rabbi Yisroel Rosenfeld, Officer Dan Mead, Diane Mead (Dan’s sister), Dr. Mylynda B Massart.